In partnership with local communities and providers, the Department of Children and Families will emerge as a world-class organization that protects the vulnerable and serves as stewards of the people to shape paths to independence for all Floridians. Protect the vulnerable, promote strong and economically self-sufficient families, and advance personal and family recovery and resiliency. Integrity, Innovation, Accountability, Personal Responsibility, Responsiveness, Quality, Empowerment, Urgency, Collaboration and Choice. Partner with stakeholders to promote competency restoration, personal recovery and resiliency. Total land area - 620 acres. Total square footage of floor space - 1,875,544. Number of buildings including residences - 223. Maintains internal power and chiller plants. Maintains internal utility distribution networks. Operates internal Food Services preparation and distribution systems. Florida State Hospital has a rich history, the site having been first used as a Federal Arsenal, built by the United States Army as an arms depot during the Second Seminole Indian War. Reportedly contracted by the United States Government, William H. Face of Pennsylvania was hired to finish carpentry on the headquarters arsenal. Construction was begun in 1832 with an appropriation of $20,000 and completed in 1839, following the war, at a total cost of $226,932.50. The original compound consisted of nine buildings in a 400 X 400 quadrangle and four out-buildings. The arsenal was taken over by Confederate troops in 1861 and used as a staging area during the Civil War. It was used by the Freedman's Bureau from 1865 to 1868, and then served as the state's first penitentiary until 1876, when Florida State Hospital was created by the Florida Legislature. Initially, there were seven patients, a single stove for heat, a superintendent, a matron and only two or three attendants. A cistern was the source of water supply and candles was used for illumination. Two of the original buildings have survived-the Officers Quarters, which now serves as the main administration building for the hospital and a Powder Magazine, which is located approximately 1,350 feet southeast of the quadrangle and is currently being restored for eventual use as a museum and conference center. The Officers Quarters, known today as the William DeWitt Rogers Administration Building, is probably one of the oldest structures of its kind in Florida. The brick and wood structure is two stories with a full basement. The main building was originally 62 feet square with four chimneys and was surrounded by a veranda. A brick perimeter wall 12 feet high and 30 inches thick formed the rear wall of the quarters with a portion of the wall still visible. Although the slate roof has been replaced with metal roofing and some of the veranda has been closed in, much of the original gingerbread woodwork of the outside still remains. The building is listed on the National Register of Historic Places. Florida State Hospital remained the only state hospital until 1947. 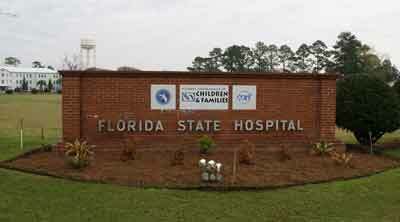 In 1959, Florida State Hospital had its highest census with 6,689 residents. In the following years the philosophy of deinstitutionalization led to a decrease in population during the 1970's and eventually Hospital capacity reached a low of 930 in 1998. Current capacity in 2013 is 959 beds. In 1999, the Hospital received the prestigious Governor's Sterling Award for Organizational Excellence, based upon the national Baldridge criteria. In 2015, Florida State Hospital received a 3 year re-accreditation certification from the Commission on Accreditation for Rehabilitation Facilities (CARF). Three years is the maximum achievable length of time for accreditation. Historical pictures from Florida State Library and Archives.